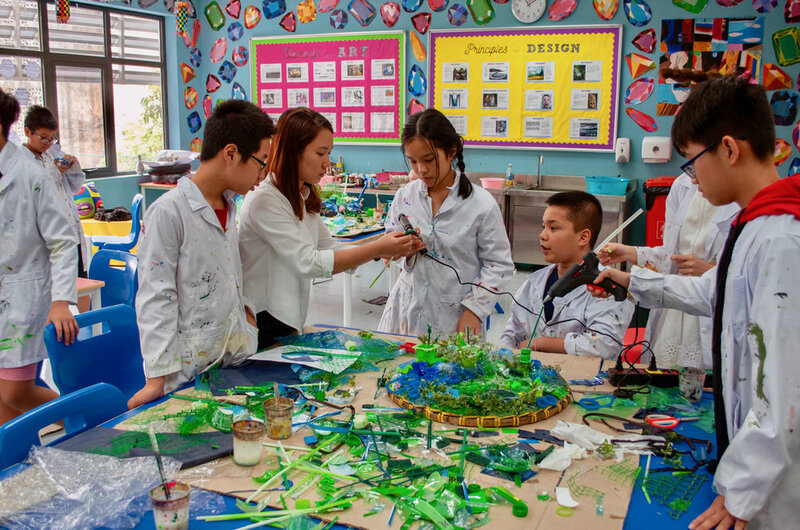 The TH School community marked Earth Day this year with artworks that call attention to plastic pollution in Vietnam and across the globe. Working with this year's Earth Day theme Ending Plastic Pollution, the Art Department found uniquely visual ways to inspire a change in our attitude and behavior about plastics. In KG and Primary, students had the opportunity to draw connections between art history and the world's largest environmental movement today. Mr. Robbie led a large-scale collaborative mixed media collage that reimagines Hokusai's woodblock print The Great Wave off Kanagawa with the sea full of plastic waste. Students also learned about how plastic waste pollutes our oceans, injures turtles, and poisons other animals. They attached pieces of plastic waste to the painting, creating a colorful and idiosyncratic update of the famous print. In Years 6 and 7, students learned about the environmental consequences of the proliferation of plastics as they worked to depict the globe covered in plastic. Using trays from the local markets as their substrate, they collaged blue and green pieces of plastic waste in the shapes of the world's oceans and landmasses, creating views of our planet that illustrate the global scale of plastic pollution. To do our part in securing a future free from plastic pollution, we at TH School - both in and outside of school - aim to reduce our use of single-use plastics and reuse and recycle plastics. Earth Day is Sunday, 22 April.